As the host of the Watertown Farm & Craft Market, we are your destination for questions. Give our booth a visit the next time you're at the market and to get your market tokens (valid at participating vendor booths only)! Local Honey and a variety of honey made products including Honey Comb, Beeswax Candles, Lip Balm, Skin Salve, Candy, and Honey Stixs! We are Duane & Linda Bender and we would love for you to buzz on in to our booth! Entertainment company, specializing in full and half face fantasy face painting as well as glitter tattoos and balloon art. Fantastic cider, donuts, produce, decor and much more! Cheese Filled Company is a local, family owned business that originated in 2014. We offer a line of new and exciting cheese filled gourmet products. Our products are like nothing you have seen before! We offer our Famous Cheese Filled Pepperoni in many different cheeses, from mild to wild. If pepperoni isn’t your thing, we also have our incredible Dilly Dawg, a deli sized dill pickle that is filled with the perfect blend of our cheeses. Come check out our newest products and try a free sample! Howdy! We are The Cowgirl Café based out of Theresa, NY and we offer a variety of tasty delights. Try our Texan steak sandwich with bacon, cheese, peppers and onions on a ciabatta roll or go for the fire braised chicken breast sandwich with cheese, lettuce, onion, and tomato on a ciabatta roll. Also on the menu you'll find a Wrangler Hoffman hot dog, and a Cowboy Burger - 100% Black Angus Beef Burger with cheese, lettuce onion and tomato on a Brioche roll. Featured sides: Nachos plain or with steak, pasta salad with homemade Italian dressing and salt potatoes. We cater too! Perfect for a customer appreciation day, birthday or private party. Excitement Romance and Award Winning Wine! One of the most award winning wineries in ALL of New York State. Our Wines have won over 1000 Medals and we are now 3x NYS Winery of the Year! With over twenty different wines, we have something for everyone. Stop by for a sample of our famous Fire Boat Red and Twisted Sister or our barrel aged Marquette and Frontenac. Visit all three of our locations for Legendary Wine and a Howlin' Good Time. Silver jewelry and beaded jewelry. Kiln fired fine silver. Unique wind chimes. ​Our beef is always going to be *at the very least* 50% ANGUS Beef. (All animals we sell for our quality beef are Angus or Angus crosses. Always at least 50% Angus bloodline.) We have approximately 130 of our own dams that are Red Angus or Black Angus... and ALL of our Sires are registered--either Red or Black Angus. Therefore the beef you buy from us will NEVER be from culled out DAIRY cows because they are no longer productive. We also help support local economy by buying feeder calves (that are also at least 50% ANGUS) from other local farmers. Offering quality plants and a lifetime of gardening know-how - Mr. Guy Drake will help your garden to flourish! Fan Favorite! Come down to try some delicious Funnel Cakes, Fried Pickles, Fried Oreos and other market specialties. Check out out seasonal selection of Organic produce grown on our farm in Pulaski. Find our booth cross from City Hall and next to Thousand Island Winery. We grow a variety of salad and cooking greens as well as heirloom tomatoes, carrots, onions, cut flowers, herbs, and much more. Our market booth is also a pick up site for our CSA for our Watertown members. We are farmers committed to saving our earth for future generations. We grow certified organic fruits and vegetables and raise pork and poultry humanly with no hormones or antibiotics, ever! We offer a year round delivery service so customers can still continue to receive our produce and other items after market is over. Register on our website today for a home or group site delivery. We have several group site delivery options around the North Country. Tie dye artist, seamstress, upcycle-r extraordinaire, Heather Barben is very excited to be participating in the Watertown Farmers Market again this year. Homemadehaven is a business that takes great stride to deliver a product that is bright, colorful and often upcycled to her customers young an old. She offers a ever changing inventory of one of a kind garments and accessories and her tie dyes are made with professional grade supply that insures your tie dye will stay bright for years. To encourage her customers to shop with her and to save boring white garments from their drab fate she is offering a chance to earn free tie dye through her promotional stamp card! Details can be found on my Facebook page. Come by for lunch at the Farm & Craft Market! You'll find our 1941 Plymouth truck and food trailer at the corner of Washington St and Academy St. We also have a lemonade stand and plenty of tables to sit and enjoy some delicious food! Craving Johnny D's on another day of the week? Visit our restaurant in the Paddock Arcade - Serving Breakfast, Lunch and Dinner. Featuring daily specials, local wine, homemade breads and soups and more! Plus we cater - Call us for your next event. Kylies Kakes and More is excited to be sharing with all of you freshly baked cupcakes with our signature style frosting, all made from scratch! We are excited to see everyone there, so please stop by and see what we are all about! Who wants cupcakes?!? ​Linda Gibbs Handmade was established in 2007, and has participated in the Wednesday farmer's market since 2010. Owner/artisan Linda Gibbs is a Watertown resident, and is a third-generation crocheter, having learned from her grandmother and mother at a young age. She offers quality handmade accessories for all ages made with ecofriendly fibers and materials, such as organic cotton, linen, hemp, silk, bamboo, alpaca, wool, and more. The Little Tea Cart brings you handcrafted organic teas created with ingredients from New York State and around the world. Little Tea Cart's tea accessories, gifts, and home decor are one of a kind, created by talented artisans in New York. After all, whether its your morning commute or a special event... shouldn’t your tea time be as unique as you are? Handcrafted genuine leather products: bags, belts and more! We have been vendors at the Watertown Farm & Craft Market for 15+ years. We make Grandma's Donuts, Carmelcorn, Fudge and more. At our booth you will find lots of homemade breads in both small and large loaves: white; whole wheat; cheddar cheese and cinnamon raisin. 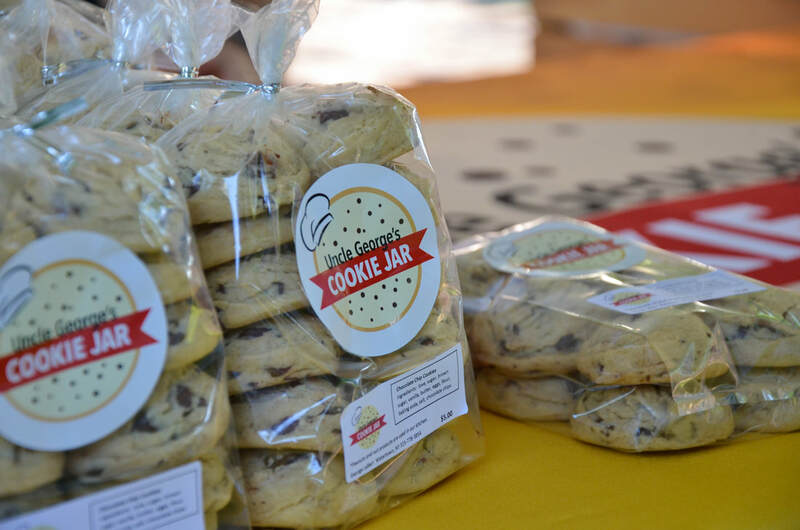 We also make an assortment of cookies including buckeyes, peanut butter cup, no-bakes and date filled cookies. All the kids love our specialty decorated sugar cookies, candy stick climbers, marshmallow kabobs and of course our pizza cookie slices! Not to mention our collection of All-American pies and fruit pie turnovers. We'd love to see you at the market! Hi, I am school teacher turned artist and I work on capturing images and ideas on wood. I make custom pieces from things around me that inspire me to create as well as working with the customer to make a piece that is special and unique to them. Many of my wood burnings have been used to create a personalized gift for special occasions like weddings, birthdays or even Christmas. I work very hard to make the image you have in your head come alive on wood. I love wood burning spoons of all shapes and sizes so be prepared to see a few in my booth as well as several unique pieces or come visit to order your custom wood burning! We sell pretzels in two varieties, salted and unsalted. You can order pretzels by the box. Each three- or six-pound box contains handy single-serving sized portions of pretzels individually wrapped. Think about giving Martin's Pretzels as a gift. Hi there, I’m Brenda DeRoche from Black River and this is Miss Brenda Hats! I do all the knitting myself and love spending time making each one special. Come by while it’s warm and stay warm all year long! There is something for everyone in the family, and the dog too! I make hats, scarves, beanies, headbands and more! You’ll find each product line in a variety of colors from trendy and bright to school pride and some with an extra sparkle. New this year - dog sweaters! You will want to know the measurements of your dog's head, chest, length from the neck to chest and the length from the neck to the tail (Custom orders available). See you at the market! Meekestead Farm is owned and operated by Ken Mix. He grows cut flowers and vegetables on the northern edge of Tug Hill in the town of Champion. Michele Morrison (M&M Crafts) specializes in fleece, crocheted, and ceramic items for all occasions. She will be attending the Market in the July and August months. She also attends local craft shows year-round. Join WIC at the nurturing station! Our nurturing station is open to the public for any family to use. It’s a great place to nurse/feed your baby if you choose, change a diaper, or just take a break with your children for a while. Inside the nurturing station we offer information about the North Country Family Health Center WIC program, breastfeeding support, and tips on cashing your Farmers market checks. We always have someone on staff for questions too! The nurturing station was created through a grant thanks to the Adopting Healthy Habits Breastfeeding Coalition. This station is portable and can be used for free at any local area event! Northern Flow Vineyards has a variety of wines to suite everyone's taste! Our business was previously owned and operated by Steve & Diane Rutigliano for 17 years. They were well known to the community, selling at the Watertown Farmer's Market every week and at many local events throughout Jefferson Country. They retired at the end of the 2017 season and sold their popular Old Fashion Kettle Corn business to their nephew (Jerry Sherman) and his wife (Cathy) and are now "C&J Old Fashion Kettle Corn". We specialize in Kettle Corn and use Mushroom Kernels, the preferred kernel for gourmet popping! Pop on over – We’ll see you at the market! OMI Naturals prides itself on using ingredients gifted to us by nature; formulated using natural and organic ingredients that deliver real results. Products are never tested on animals and are created 100% cruelty free and vegan. Our enhanced personal care lines of hair care products, body butters, lotions, body scrubs, bath and shower gels, bubble bath, body oils, bath salts, bath bombs, soaps and lip balms, provides a natural alternative, containing no synthetic ingredients or harmful chemicals. We expertly design products suitable for all skin types and take pride in knowing that our customers receive quality every time! Knowing this truth, you can shop with absolute confidence that we would not sell you a product which we have not used ourselves. Unique jewelry collection made from Ammunition that was "once fired". We re-purpose spent ammunition into custom, personalized jewelry for men and women. We also sell fresh eggs. Plants, Vegetables and Flowers ... Oh my! Gourmet Popcorn in a wide variety of flavors. Find anything from caramel corn to pizza flavored popcorn at our booth - See you there! Best known for our sweet corn we also offer peas, zucchini, squash and other homegrown produce. The Press is Watertown's newest food truck serving gourmet panini sandwiches! We will have a rotating menu of panini offerings from classics like the Cuban and Tuna Melt to more adventurous like the Porkarella and whatever other delicious combinations we can come up with! In addition to panini, The Press will be offering a soup option, chips and drinks. Come on by and try a hot stuffed panini today. Breakfast options too! Rock and Jam has at least 20 flavors of Jam at a time, everything from carrot cake to strawberry rhubarb and a whole lot of yummy in between! Plus 4 different pepper jellies. That's the "Jam" side of the business, the "Rock" side consists of handmade cement items like flower pots, mushrooms, ladybugs, coasters and more. So stop by at the market to try some goodies! 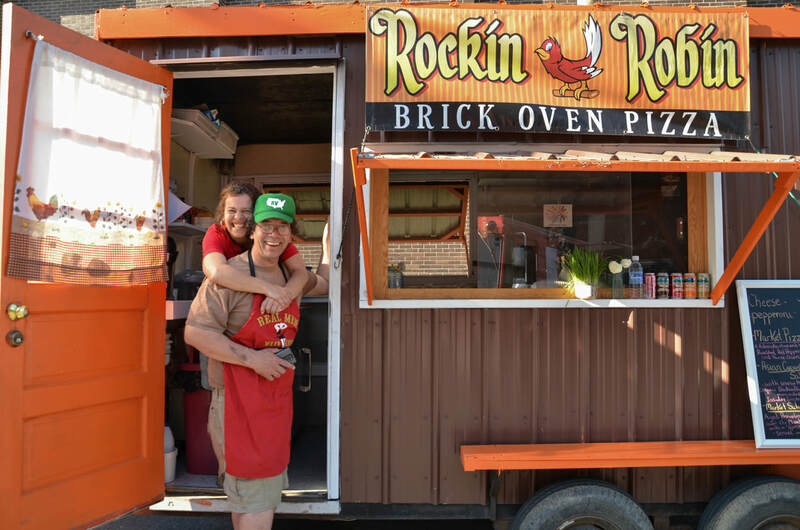 We are a food truck equipped with a homemade, wood fired brick oven. We specialize in pizza and breads, using as many local/seasonal ingredients as we can. Running Boards Marketing provides Advertising for Business, Government and Special Events. Our services include Graphic Design, Digital Mobile Billboards, Aerial Drone and Commercial Production. Our Mission is to provide Cutting Edge Marketing Solutions to our Clients and to Advance their Brand Recognition. Running Boards Marketing is Best known for it’s Digital Advertising Vehicle's (DAV’s). Puppets are for any age, old or young. Creativity and storytelling abound when you connect a child with a puppet! Or, picture a grandparent or a mom or dad telling a story while the puppet characters interact with the child. I make crocheted puppets using washable yarn. Everything is crocheted or sewn onto the puppet. Nothing is glued. Super heroes, motion picture characters, muppet characters, and animals are available. Don’t see your favorite character? Or does your child have a favorite story? I take special orders. Come and see my animal puzzles! A crocheted animal that comes apart into three pieces! I also have hats, mittens, baby blankets and fabric bibs. We have been serving Watertown NY since 1985 - Our flagship stand. Offering Our Specialties of Hofmann hotdogs, Italian Sausage and Chicken Pitas. We have now branched out into BBQ serving the most delicious, pulled pork, beef brisket and chicken. Let Scotty’s Cater your next event from backyards, to weddings and corporate events. No event to big or small we can offer anything from your backyard food to clambakes. New for 2018. You can buy Fresh pickles by the pint or quart. You can choose from Dill, ½ sour , Full Sour, Garlic, Horsey, Giant Pickle on a Stick, Sweet Hotties and Pickled Green Tomatoes. We are also offering Fried Pickles on a Stick and New ... Giant Pickle Dog! Unique item on a stick. We take an Idaho potato spiral it on a stick and deep fry it. You can have it crispy like a chip or soft like a fry. You can choose from 7 different flavors. Salt and vinegar, sour cream and onion, butter and garlic, salt, salt and pepper, Apple pie, cheddar cheese and BBQ. Book us for your next special event. Looking for unique gifts, check my booth! I’m Sharon, retired and keeping busy with needles…sewing, knitting and crochet. For the kitchen, there are microwave potholders (extremely popular), baked potato pockets, potholders, aprons made from men's shirts, casserole carriers, scrubbies and other items. For babies, the cutest infant flip-flops, crochet, stuffed monkeys and pandas (throw them in washer and dryer), fabric growth charts, etc. Dog coats and collar covers for your pets. Unique fabric purses, purse organizers, scarves, and hats for the girls! Different style winter hats for entire family. Let’s not forget home & entertainment – wineglass coasters, wine bottle totes, doilies, wreaths, table runners, and place-mats. Simmons Farm is the 2017 vendor of the year for the Watertown Farm & Craft Market. We specialize in great customer service and the highest quality in our produce. We are one of the largest vendors at the market with an eye-catching display and great products to include all fruits and vegetables in season. Early spring will bring Vegetable plants and flowering bedding plants as well as beautiful hanging baskets. Our vegetables are local and piled high with great selection and variety. We also have maple syrup products, eggs, cheese curd, and a few craft items here and there throughout the season. We take great pride to bring to customers top quality at affordable prices. Stop by each week for new recipes! Craving something cool during the summer months? Have a Sweet tooth? Look no further! Watertown's Premier ice cream and sweet shoppe is here! Join us, grab an ice cream cone and enjoy the sunshine on Sterling Street. Make sure to 'Like' us on Facebook to keep up with all of the sweet events we have planned at our downtown location! Hand-crafted sterling jewelry that is truly one of kind! Stephens Media Group provides all of the best hits from a variety of music styles to northern, central and western New York State. Check out live broadcasts from Z93 right at the market! ﻿﻿Sweet Pea Farm is a small family farm located in Champion, NY. We raise Olde English Southdown Babydoll sheep for their wool, we shear our sheep ourselves and wash, pick, card and sometimes dye our own wool here on the farm. We sell whole fleeces, roving, and our needle felted and wet felted items. We raise pastured chickens and turkeys on our property as well. Our meat birds are raised in a natural healthy environment and never given hormones or antibiotics to provide the healthiest meats for your family. We also grow a variety of greens, tomatoes, beans, root crops, and squashes on an acre of our land. Thousand Islands Winery is the largest farm winery in Northern New York State and is located along the majestic St. Lawrence River on a historic forty-acre farmstead established in 1836. The Winery began its operations in 2002 with the purchase of the farm by Steve Conaway and his wife Erika. The primary grape varieties being planted in the Thousand Islands Region include Frontenac, Frontenac Gris, Marquette, and La Crescent. The development of these cold-hardy grapes is the very reason we now enjoy the benefits of the ever-expanding Northern New York wine region. Tug Hill Artisan Roasters is a local coffee roasting company working with specialty grade coffees from around the world. Being a micro-roastery, Tug Hill Artisan Roasters has the ability to purchase small lot beans from small scale farmers who are on the front line trying new and exciting things in the world of growing and processing coffee. With its wide range of coffees, Tug Hill Artisan Roasters is confident you'll find something to mach your palate. Breads, baked goods, produce, cut flowers, prepared salads (in season). We’re happy to share a part of our “country life” on Tug Hill with our customers. We strive to provide quality, fresh foods that are hard to find anywhere else! All season long you can find fresh artisan breads, scones and other baked goods made from scratch – come early, they sell fast! In season, pick up fresh produce we've grown organically. Lord willing, we’ll have rhubarb, asparagus, peas, carrots, beets, spinach, lettuce, greens, kale, swiss chard, beans, cucumbers, tomatoes, eggplants, peppers, onions, garlic, cabbage, blueberries, raspberries and more. We are partnering with “Saladvantage” to bring you prepared salads made with our own produce! We sell Chocolate Chip Cookies! Real and always homemade with love! Nestled between the beautiful Tug Hill Plateau and the Winona State Forest Worth Gold Farm is the perfect location for calm, happy animals to feel comfortable and graze freely. The farm is owned and operated by The Chamberlain family bringing you the very best meat and vegetable products from a genuine small family farm. We offer all natural grass-fed beef, pork, chicken, turkey, free range eggs, and seasonal vegetables all without the use of hormones, antibiotics or any type of artificial fertilizers.